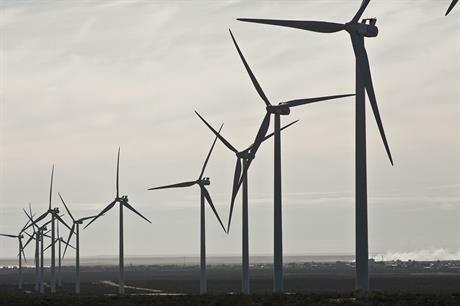 WORLDWIDE: Global wind installations are set to break the 60GW barrier once more from 2019, the Global Wind Energy Council (GWEC) predicts. In its Global Wind Report 2018, GWEC says new capacity in 2018 will remain at a similar level to the 52.5GW installed in 2017. This is due to the "policy gap" left by the transition to auctions in India, meaning it will have a quiet 2018, as well as major markets in Europe installing less than previous years. However, from 2019 GWEC predicts a "growth spurt" in the industry, surpassing 60GW a year of new installations from 2020. "The aftermath of the global financial crisis in the previous decade resulted in average global markets of about 40GW/annum for the period from 2009 and 2013," GWEC explained. "Breaking through the 50GW barrier for the first time in 2014, the industry set a record of more than 60GW due to anomalously high installations in China in 2015. "In 2016, the market returned to the ‘new normal’ of just over 54GW, and 2017 was in the same general range, which is also what we expect for 2018," it said in its report. "The annual market will return to growth in 2018 and 2020, breaching the 60GW barrier once again and continue to grow, albeit at a slower pace, in the beginning of the new decade. "We expect total cumulative installations to reach 840GW by the end of 2022." Cumulative capacity at the end of 2017 stood at 539.1GW, GWEC said. GWEC has also selected four markets it believes could play "dominant roles" in the industry by 2030: Argentina, Russia, Saudi Arabia and Vietnam. Argentina has had a troubled past, with repeated financial crises forcing the government to default on loans over the past two decades, and scaring investors away. However, since the election of president Mauricio Macri in 2015, the country "seems to have done everything right" GWEC said. Its recent tenders and policy changes now means Argentina has a 3GW pipeline currently being built out, and the market has a 1GW/year potential. GWEC said the South American country has enough wind resource to power the whole region, but in order to fulfill its potential, "substantial investment in transmission infrastructure" was required. Russia and Saudi Arabia, unsurprisingly, have large amounts of renewable energy resource. However, it the countries’ oil and gas industries have held back deployment of wind and solar. GWEC cited a ten-year-old wind resource assessment in Russia, which claimed it could produce 80,000/TWh a year of electricity, more than three-times global consumption. Current and future technology could exploit that potential even further. Last year’s auction in Russia, tendering 1.65GW of capacity to be build over the next five years, is cause for some optimism. Some of the industry’s largest names, notably Vestas, Siemens Gamesa and Enel, have "taken the plunge" in the notoriously difficult business market. This led GWEC to predict a "mini-boom" will take place, in some form or another, over the next five years. "The tremendous resource is there, and there are enough Russian companies involved now, both state-owned and private… What happens next is anyone’s guess, but if our energy future is going to be sustainable, Russia has to be a part of it — and it could be of tremendous benefit to the country if they so chose," the council said. Saudi Arabia, equally, has an overdependence on oil and gas, developed over the past couple of decades, which it is now trying to solve. It is targeting 3GW of renewables by 2020, and 9.5GW by 2023. Solar is particularly competitive, but the country’s Red Sea coastal region also has excellent wind resources. However, "steep" local content laws are proving to be a barrier. "It’s a potentially big market not far from Europe, and has the ability to move quickly if necessary. It could be an exciting market, in both positive and negative ways, but not for the cautious or faint-hearted," GWEC said. Vietnam is a particularly interesting market, given its potential for on and offshore wind deployment. GWEC also noted the country’s wind resources are among the best in the region and electricity demand is growing by 10% a year. However, the lack of local finance means foreign investors or developers need to take on currency risk, on top of the usual risk of entering new markets, GWEC said. Also, the country’s power deals are not "bankable" by international standards, GWEC pointed out, which pushes up premiums.